Thank you for visiting our website. 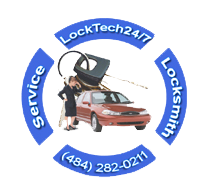 LockTech24/7 is a leading professional and mobile locksmith company. We serve residents in Bethlehem, the Lehigh Valley, and surrounding area. Never worry about paying too much for a locksmith service again! We know the industry well enough to give you a quote right over the phone. We will also provide you with a free consultation in any non-emergency situation. LockTech24/7 offers full suite of local locksmith services, such as emergency, automotive, residential, and commercial locksmith services. Our customers in Bethlehem PA, feel secure when they call us for service. They well known that we’re working fast. We can open nearly every door, safe, or file cabinet. As well as re-keying, repairing or replacing nearly every lock, regardless of who makes it. Everyone wants to be in control on the most precious things in their lives. They are taking good care of these thing and organizing them in place to keep them safe. However, mistakes can happen no matter how careful we try to be. We lock our keys in our business or home. Sometimes, we misplace the keys of the car, or, even worse, we lose the entire key ring that is associated with our life! In these cases you need the help of a trained professional locksmith to get open it for you. If this happens to you, why not call the best locksmith service in Bethlehem PA, LockTech24/7? Our locksmiths takes care of any lock and key issue you may have. We take care of everything from cutting and programming automotive keys to installing a whole new lock or security system in your home or office. If you lock yourself out of your home, we work with the most precise cutting edge tools, to ensure no damage when we help you re-enter your property. Leave your security to the professionals! Call LockTech24/7 in Bethlehem for high quality products, great service, and reasonable price. With a wide range of inventory and security hardware, we are your one-stop mobile locksmith shop. Our locksmiths are experts, and specializes in all kind of emergency locksmith. You can also call us to schedule appointment, as well as sending us an email. With this in mind, our highly trained locksmiths are ready for your call 24 hour a day, 7 days a week. Emergency Locksmith Services in Bethlehem PA are the need in a daily basis. That because an emergency situation can happen to anytime. We provide emergency services round the clock, and throughout the Lehigh Valley. Our locksmiths maintains an efficient 24/7 emergency locksmith services with full residential, automotive, and commercial locksmith needs. We’re always ready to save you out of any emergency locksmith situations. This is the time to find a good locksmith service at your convenience. With this intention you also may program our phone number on your phone. In time of need of emergency locksmith, call us for faster service. We have the experience to solve any sort of emergency locksmith problems. Needless to mention that we are the best in Bethlehem in what we do, locksmithing. If you find yourself in the middle of the night in a jam, and need emergency locksmith, please give us a call (484) 282-0211. It has become very common to hire an automotive locksmith service for car door unlocking service. Forgetting the car keys inside is a common event to almost everyone. Most of the people as well as experienced drivers make this mistake, even locksmiths. Don’t get stressed in this type of emergency situation. You are welcome to call us for help. As a matter of fact, and as one of the best automotive locksmiths in this area, we can also provide you with a new key to your vehicle or to repair an ignition lock. We can cut any car key, including high security auto keys. If you need to program a transponder car key, we can do it, too. on site! With this intention, we have a unique standard and company profile in Bethlehem. Our clients are always happy and satisfied because we provide quality in our work. And because we give positive impression and peace of mind. Please call now (484) 282-0021, and we’ll be on the way for help. 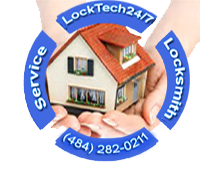 LockTech24/7 Residential Lock & Key Service is a wide range of residential locks, keys, and security related services. With our 24 hour of emergency services, you never have to worry when you lock yourself out. Our residential services go far beyond helping people to get back in of their homes or apartments. If you need to add a deadbolt on your door, or to repair a broken lock, we got you covered! We also offer an upgraded security, making your home even more safe and secured. For those who have more than one key to their house, we offer lock re-keying service. Our locksmiths can match one key to all your locks. On the other hand, we can also install peep-hole on your door. That gives you the option to see who is knocking on your door. You can simply watch out through the peep-hole without opening your door. In the last decade we have grown our residential locksmith services in Pennsylvania into one of the most reliable professional locksmith services in the area. For your convenience, we are here for you. No matter what time of day or night. No matter what kind of locks you have on your doors. The people who are to find the best locksmith company for their homes, prefer to hire LockTech24/7. Be that as it may say, we provide reliable and efficient residential locksmith service in Bethlehem PA. This creates a long term relationship with our customers. 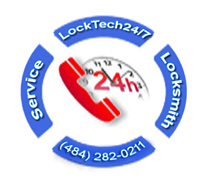 It has been noticed that LockTech24/7 is not an ordinary locksmith company in the area. The majority of our customers repeats calling us whenever they need our service, especially when they’re locked out of home. Please call (484) 282-0021, and we’ll be on the way for help. For some people, the office is a place where more time is spent more even than our own home. And, for many people, the office becomes a sort of second home. Therefore, just like a residential space, we want our office and the belongings inside to be safe, secure, and protected. Especially when in most cases, and regardless to emotions, your business hold inside much more valuable assets. Commercial doors are very heavy because businesses have varying amounts of employees and customers comes in and out very often. Perhaps, your customers are coming in and out on a daily basis, so you must quick commercial locksmith service. An office lockout situation can happen any time. A lock issue may occur around the office, eventually, and you can find yourself locked out. Not to mention maybe with a broken key at the middle of your working day. Your local commercial locksmith is only one phone call away. For those business owners, a locksmith may be necessary at one time or another. Because businesses tend to have locks and keys for a variety of doors for the office or storage room. As well as conference room or file cabinet lock. It’s important to have a reliable locksmith available when you need a lock and key service. 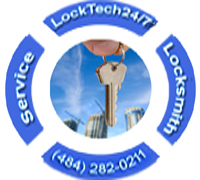 LockTech24/7 has turned out to be the best commercial locksmith service in the Lehigh Valley. We use advanced tools to handle any commercial locksmith job on the spot. Whether it’s outside in a dusty industrial building, or remodeled office. So if you would like to replace a commercial lock, or upgrading the security of your business, please call us. In addition to the basics, we can also help you with more difficult projects. Our experts can handle projects such as electric strike installation, key-less entry system, and more. As always, with all of this, we provide competitive pricing in order to give you a reasonable offer, and our guarantee ensures customer satisfaction. Please call (484) 282-0211, and we’ll be on the way for help.